National Defender, v. IV, no. 12, Tuesday, November 1, 1859, Whole Number: 169: p. .
Annotated and transcribed text from the digitized copy in the Historical Society of Montgomery County Collection. 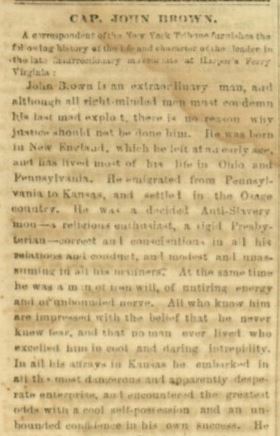 John Brown(3) is an extraordinary man, and although all right minded men must condemn his last mad exploit, there is no reason why justice should not be done him. He was born in New England, which he left at an early age, and has lived most of his life in Ohio and Pennsylvania. He emigrated from Pennsylvania to Kansas, and settled in the Osage country. He was a decided Anti-Slavery mon [sic]– a religious enthusiast, a rigid Presbyterian – correct and conscientious in all his relations and conduct, and modest and unassuming in all his manners. At the same time he was a man of iron will, of untiring energy and of unbounded nerve. All who know him are impressed with the belief that he never knew fear, and that no man ever lived wo [sic] excelled in cool and daring intrepidity. In all his affrays in Kansas he embarked in all the most dangerous and apparently desperate enterprise, and encountered the greatest odds with a cool self-possession and an unbounded confidence in his own success. He was made the object of the most cruel persecutions of the Missourians, and all the bitterness and steep determination of his nature were stirred up from the very depths in retaliation. One of his sons was met alone on the road by a large party of invading Missourians, and cruelly, brutally murdered without a cause. Another son was for no cause but his political opinions, loaded with chains and driven on foot before the horses of his captors from Osawotamie to Tecumseh, under circumstances of cruelty as to destroy, first his reason and next his life. His own house and the house of his son were both fired and destroyed. The women of his family were grossly insulted, and a committee appointed at a public meeting (following the example of the Pro-Slavery men under Emory,(4) who killed and drove out the Free State men of Leavenworth) notified Brown and other Free State men on Potawatamie Creek(5) that if they did not leave the Territory in three days they would be hung. His friends and neighbors were murdered around him ; he was forced into a war of self-defense, and finally a price was publicly set on his head. The effect of these things, in connection with all the other outrage, oppression and murder perpetrated around him, upon a man of Brown’s temperament, may be conceived. He became a fighting man, and developed qualities that excited the admiration and surprise of his friends and made him the terror of his enemies. Though remorseless and relentless as death itself, he did everything under a sense of duty and high religious excitement. The more fervent his prayers, the harder fell his blows, and the more signal and bloody his victories, the more heartily did he return thanks to the Lord after the fight was over.